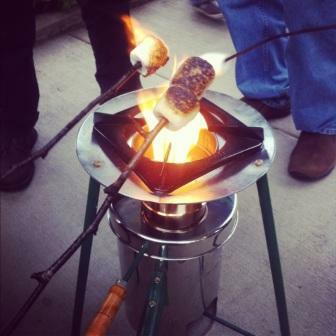 REPORT: BIOCHAR STOVES MAKE A SPLASH AT THE ETHOS CONFERENCE. The ETHOS (Engineers in Technical and Humanitarian Opportunities of Service) conference, held annually in Seattle for the past 12 years, draws improved cook stove designers, implementers, and aficionados from all over the world to discuss the latest in cook stove research, efficiency, field tests, commercialization and policy. I attended for a second time this year and was once again impressed with the diversity of people attracted to this field. All conference proceedings will be posted shortly. This year biochar was everywhere. The Friday prior to the conference, the Biomass Energy Foundation (BEF) hosted a Micro-Gasification workshop at the Mckinstry Innovation Center in South Seattle. Participants heard from President Kathy Nafie on the CAFDA model (Culture, Application, Fuel, Device, and Acceptance) of cook stove dissemination and from Paul Anderson (of BEF) on the wide variety of Micro-Gasifiers around the world. We then made a TChar prototype (part charcoal stove/part top lit up draft micro-gasifier or TLUD) and cooked lunch on three different biochar stoves from Malawi, Germany, and India. Mr. Miles introduced biochar by explaining terra preta, and the Cool Vege project in Japan. He highlighted two major resources on the subject of biochar stoves: Christa Roth’s manual on Micro-Gasification and the Biochar Stoves paper by Carter and Shackley of the UK Biochar Research Center. The group discussed the issues of logistics and where biochar stoves are most suitable for cooking; all participants saw the merit in a diversity of solutions for rural, peri-urban and urban settings. They also highlighted fuel and how it is processed and transported. Ms. Roth pointed out that Malawi has one of the highest transport costs in the world and that these costs must be factored into the model. The importance of partnerships for biochar application was emphasized. Local universities, fertilizer companies, agriculture research centers, and others who know and understand the local soil are key players in creating a viable biochar stove system. Such partners can assist in creating a biochar blend that would best suit the local circumstances. 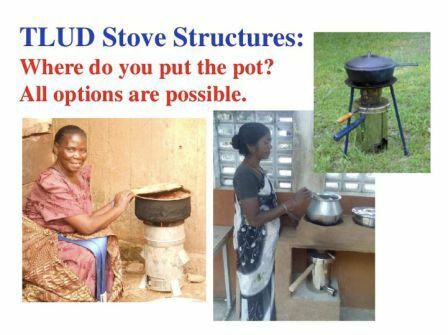 Design challenges include the ability of the stove to produce low heat for simmering which can be solved in the shape and structure of the stove. The Servals company in India has designed a cooktop structure that includes two burners for one combustion unit. These stoves can be tuned to work in a wide variety of ways. Biochar stoves can be incredibly clean. Mr. Still spoke of a TLUD stove he tested that had 50% thermal efficiency and created few particulate emissions or carbon monoxide. 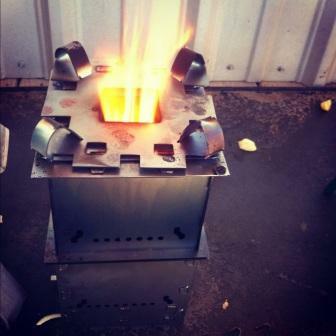 These stoves are ideal for people switching from charcoal stoves because they act much the same, the fuel is loaded in batches, they light very quickly and easily, and the cost for fuel is comparable. The fuel flexibility of biochar stoves is very exciting; everything from maize cobs to seed pits, to pelletized grasses or other agriculture waste can be used. It may require a whole new supply chain that includes a drying process. Fire literacy, a term coined by Ms. Roth, is the ability of one to light, observe, and control fires. She spoke of one friend of hers in Malawi who could swipe her hand thorough the flue gases and tell you that the fuel is too damp. The fire literacy of many stove users is often much higher than that of the stove designers. Later that day, I gave a presentation on the advantages of biochar stoves focusing on fuel, emissions, value of char, and climate stabilization. There were also micro-gasification talks by Marc Pare, Robert Fairchild and Dr. Anderson. Mr. Pare has been living In Vietnam for the past year working on more efficient biochar kilns for brick makers, and he presented on rice husks as a fuel. Robert Fairchild presented on the new concept of the TChar Stove. Part TLUD, part charcoal stove, the TChar was invented last June in Malawi at a BEF Stove Camp. 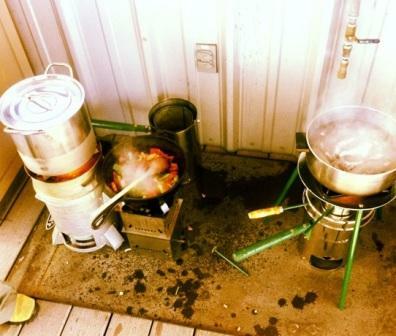 The top portion of the stove acts as a gasifier, and once the fuel is reduced to char, the cook can take off the top and use the bottom as a charcoal stove. The model gives the cook the flexibility to save the char or use it right away as fuel. The TChar seen here was designed by Christa Roth and others in Germany. It is a flatpack design intended for easy shipping and assembly with a hammer or even a rock. Dr. Anderson gave a final keynote address on the future of micro-gasifier cookstoves. He discussed the versatility of TLUD structures and the option for having multiple combustion units. He also made several predictions on the future of TLUDs, noting that designers and users still have a lot to learn. Cooking lunch on TLUDs; courtesy of Amanda Ravenhill. Making s’mores on the Servals Champion stove.